Dancer's Pose can seem daunting in its traditional form alone. With these Dancer Pose variations, we shift the view of the pose to one of play and creativity. Find the variation that feels comfortable to you, or try one each practice to keep it fresh and fun! 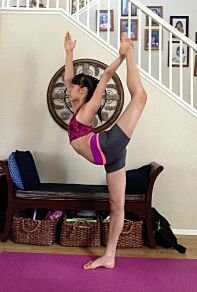 This pose is really the first step for entering Dancer's Pose, and is a great place to find your foundation and balance. However, we can take it a step further by focusing in on the quadricep. Open up the right palm, grasping the inner ankle, and raise the left arm to the sky. Hug the inner thighs, as you bring the right ankle closer to the glutes. Drop the tailbone straight to the ground while drawing the abdominals in and up. Tip: By keeping the tailbone grounded, it will increase the stretch in the front of the thigh as you hug the right foot in. The full pose is a wonderful example of balance through movement. It requires a constant shift of kick and pull in order to find the stillness within. From the quad stretch variation, keep the hug of the inner thighs as you start to kick back. The continuous hug inwards will keep the knee from splaying out to the side. The right leg should disappear behind you, as the hips remain square. Focus on kicking back, and the leg will naturally lift up. Once you have a nice backbend, hinge from the hip to tilt forward. Tip: If you start to tip forward too far, kick into the hand. If you begin to fall back, pull more; thus, finding the dancing quality, an ever fluid movement that enables balance. From Dancer's Pose, move the right foot into the crook of the right elbow. Bend the left arm to reach back and clasp the hands together. Lift the heart and gently press the right foot into the arm to press the leg up further. Tip: Have fun with it! Although the Mermaid variation doesn't necessarily take you into a deep backbend, it is an opportunity to express creativity and inspiration to come up with your own variations. This Scorpion variation can be a little tricky to get into, but once entered, allows for an easier way to square the hips. It also takes a little more of the asymmetry out of the back bend. Start in the quad stretch, grasping the inner ankle. Bring the elbow out and up, rotating the shoulder so that the elbow points straight up. Bring the left hand to meet the right, hugging the elbows in towards each other. Tip: The rotation of the shoulder is the main obstacle in the pose for most people, but can be overcome by the use of a strap. By looping the foot in the strap, bring the elbows to point up. As flexibility increases, walk your hands up the strap until you eventually can grab your foot. The deepest expression of this pose is truly a pose for the dancers, requiring much flexibility. Full Split is pretty much an extension of the Scorpion variation and can be started there. From Scorpion, begin to extend the right leg, kicking back into the hand. As you find resistance, slide the hand down the leg, towards the ankle and calf. Keep the hip down by internally rotating the leg and hugging toward the midline. The further you tilt forward, shift the weight to the toes to prevent hyper extending the knee. Tip: Don't stress too much about straightening the leg and forcing your way into the pose. Focus on keeping the integrity of the pose and rolling the right hip down as you extend the leg. What’s your favorite Dancer Pose variation?